The Smoketree is a member of the Pea Family. It appears as a small tree or shrub that grows to 20 feet in height with a trunk up to a foot in diameter. The bark is a dark, grayish brown with many scales. 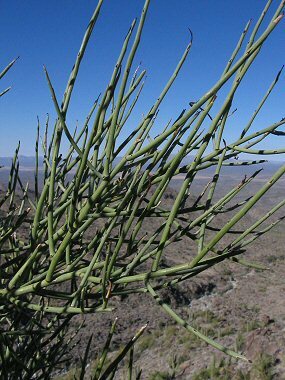 The plant is typically leafless, however, the many gray-green twigs produce food for the plant by performing photosynthesis. 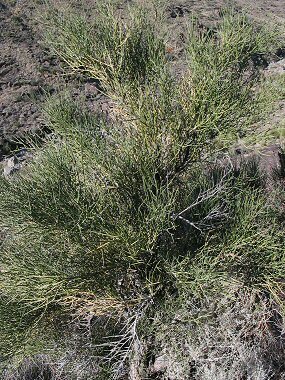 The Smoketree typically grows in sandy desert areas at elevations below 1000 feet. The Smoketree is also known as: smokethorn, smokethorn dalea and indigo bush. The plant typically blooms between May - June and produces bluish purple flowers to 0.5 inches in length in a cluster to 1.5 inches long .